It doesn’t take a genius to understand that crackers on any given day would add to pollution – noise and air. Sometimes, the manner in which crackers are burst right through a small road or a main road during a wedding “Baraat” is certainly a nuisance to drivers and pedestrians. But courts going about issuing diktats and bans on crackers or other social celebrations is being seen as an “attack on Hindus”. Because, courts have largely remained silent on silly practices of other religious communities. 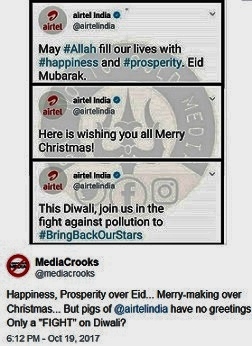 And it’s not just crackers during Diwali. Commies and Fiberals have systematically attacked every Hindu tradition. From Karwa Chauth to Holi to Jallikattu to temples to Kavarias, abusing and slaughtering cows nothing has been spared. These Fiberals did not even spare Hindu Gods and icons. They have trashed Ram, Sita, Shiva, Ganesh and even called Durga a “prostitute”. Courts are either ignorant or are deliberately blind to the systematic abuse showered on Hindu practices. This, in a scenario where Hindus are the only ones willing to reform their practices. Try telling Muslims to delete hateful passages from the Quran. Try telling Christians to stop their nonsense about miracles by some glorified fake angel or their vagabond practice of “miracle healing”. The hatred and abuse of Hindus and their practices had dramatically increased during the 10 years of Congress-UPA. Sonia and her gang had plans to destroy Hindus, Hinduism and turn India into a Chrislamist nation. Congress itself is seen as anti-Hindu and for good reasons. Therefore, Hindus are now saying “enough is enough”. From reports, it seems Delhi burst more crackers on Diwali this year than the last year just to throw eggs on the faces of SC judges and the Commie Fiberals who wanted to ban crackers. I am sure RahulG doesn’t know a damn thing about Krishna or Dwarka. But he goes to Dwarkadish temple to pray. Like his mom, he still thinks Hindus are fools. That Congis can publicly slaughter a cow and feast on it and then go to Gujarat and beg for votes is as moronic as Congis can get. As for Mullah Kejriwal, he has shed his Muslim Topi and scarf and is seen a rare prayer at Diwali. I don’t know if Ram or Krishna will work for these guys. But I certainly do know, there is a fear of Lord Ram that has crept into these folks. 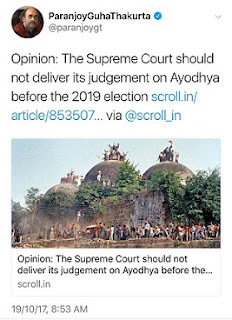 If it reforms them and stops their Hindu-hating – Good! If it does not, then Hindus will continue seeing them as descendants of Raavan and the Kauravas. Outstanding. One word to describe. This resurgence was long due. Pot boiling for over 1000 years, magnified after Nehru systematically denied Hindu in free India right place. The school education was tolerated as homes were strong on religious & cultural education. But with nuclear families that is going and current generation wants public discourse to be right and does not believe in religion as private idea to be practiced in closed doors (as per commies) when outside every abrahaman abuses Hinduism. Enough is enough and this will rise only for better India only. A great post on Hindu revival. Hindus have always respected minorities and sheltered them. However Congress right from Nehru Gandhi time found minorities as a vote bank and used that as trump card. There are other political parties too which have gone beyond saner norms of appeasement. Certainly Ram has taken centre stage in India. Politically as well as faith wise Ram will unite the Country as seen now. Dividing and ruling days are over. Let everything fall in place and respect for indian culture be a norm. Already it is seen world over but our locals are blind only to be decimated politically and reduced to bystanders in larger congregation of future alignments. Cracker ban by SC was a blessing in disguise. It brought out the hidden truth that laws should be practicable and sensible not manipulative. Very apt and timely writeup. Want every citizen of India to read it. That is because the MSM is confined to only Lutyen's Delhi. They do not venture out beyond it, except for covering the lynching. Blessed are we to read this.. rejuvenated even more..
Time has come for us to raise and protest. We need to do ourselves. I may add that the Congi Trojan horses, such as the Lutyenites or the 160/180 cabal within the BJP are a covert threat. They must not be underestimated. Happy New Hindu Year. The article is nicely written...good work. History of Hindu revival will definitely record your contribution in shaping it. Wishing you Happy New Year and God bless you. Power to you bro...you always make the commies and funerals naked whenever they do acts behind the curtains. 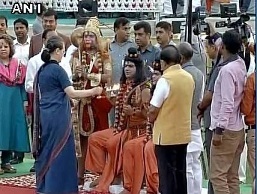 Sonia doing RAM puja....!!! This one event signifies how badly they are impacted by anti Hindu acts.. Excellent Article...More power to you. Excellent article, but I would like to add that contrary to Hindus' expectations, the present government did nothing in any of these cases of judicial overreach. It is not for the supreme court to decide how the nation will be administered, it is the Govt's domain, yet it appears now that the nation does not need a government, the courts will administer the country. How can anyone justify court intervention in matters which are related to defense policies, foreign policy and everything which the government is supposed to handle. Court adjudicating on use of pellet guns, issue of illegal infiltrators and so on. Was the government elected to be governed by a excessively assertive Judiciary or it was elected to govern the nation as per collective will and aspirations of the citizens. If instead of asserting it's supremacy the government is silently allowing itself to be dictated. It is judiciary's job to ensure there is no transgression of law, to ensure equal rights are available to all citizens, it is not the Judiciary's prerogative to make laws, which it is slyly trying to do. And under the circumstances it is the Govt's duty to ensure that the law interpreters do not become law enacted. If the government fails to do so, it is presenting itself to be a weak government unable to understand its duties and the aspirations of the electorate. Or is it a calculated move by BJP? By not taking a confrontational approach with judiciary, ultimately judiciary is getting exposed. And BJP is not outrightly annoying non Hindu community. Well said.... Time to teach SC the Limit of tolerance. Well as I see India today.. 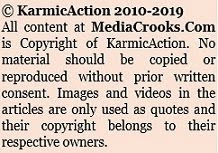 In 2014 we carried out huge disruption in ecosystem by throwing out Chrislamistics but again this ecosystem is way to more powerful then we can think of. I remember on tweet which says "One Phone call and Tista got bail, and we are still scratching surface". This defines the depth of ecosystem we are fighting with. And to win this battle we need all. Like long time approach to get rid of Support system plus some hard hitting step for Hindus from Govt(Like Yogi does) to send message both side. i.e. Hindus we are with you and sikular..your days are gone. this may create some hue and cry but it will give much needed support to us to keep fingting. 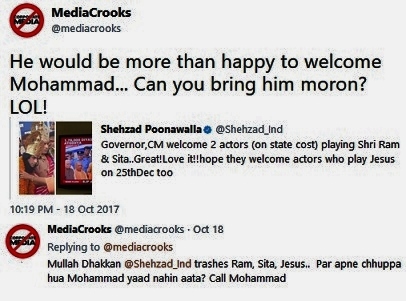 Once again, Admire you MediaCrook. You are candid as always. One more thing coming out of this crackerban crap that the people are not happy with this collegium system and their koop manduk views. These librandu Mananiyas are in totally disconnect with the people. Brilliant! Fear of Ram has picked up from the lighting of Ayodhya. Jayeebhava Yogi Adityanath. Jayaho, Ravinar!! Jai Shri Ram ! Jan Shri Krishna! Bhavya Ram Mandir is being built in billion minds & soon we will have a physical Mandir in Ram Jhanmabhoomi. Thanks SC to have given an opportunity to Hindus identify their enemies. Seva of this website is remarkable. While your writings on every subject can never be belittled or ignored, a lot if credit for revival or Renaissance of /Hindus/Hindutva/Hinduism goes to the fearless advocate and crusader Guruji Dr Subramanian @Swamy39 who has travelled all across the country and abroad for the Revival. His Virat Hindustan Sangam is doing a wonderful job ably assisted by Mr. @JagdishShetty and other office bearers. Your writings must continue to wake up Hindus and the Fence sitting Sickular Hindus. Our Sanskriti, heritage has been suppressed far too long by #chrislamist pigs and commie rats. They too, like the Congress, MUST DIE. JAI HO. Great write up & very timely. Pray that the Almighty provides you with more energy to continue the crusade you are very much a part of. The fuse is lit and the take off is happening. Fake Congis, Commies beware , your time is limited. Reform or perish. This is HINDUSTAN not Chrislamistan. Stupid Hindus feel honoured when Catholic Rahul visits a temple.On the other hand Rahul Gandhi should not be allowed to enter Hindu temples as a non-Hindu.Sonia Gandhi was not allowed to enter Pashupati temple at Kathmandu.Even Tirupati temple has a custom that any non -Hindu should sign a register expressing faith in Hinduism.Late YSR Reddy threw his weight to allow Sonia to enter without signing. An excellent exposure of the conspiracies of the anti Hindu gangs.An awakening moment for Hindus to unite and thwart the evil designs of d gangs.SC should introspect n focus on more serious issues,back log cases. temple has been there since centuries and definitely since the year India won independence and the dynasty members were born. But the throne aspirant of dynasty could think of offering prayers there only now..afer three successive drubbings people of Gujarat gave his party and one mammoth rejection by people of India.To make them continue visiting DWARAKA and other temples let people of Gujarat and India continue the drubbing for many many years to come. Block Rahul's visit in Hindu temples. He is not wanted here. Very good article. Keep continuing in highlighting hindus cultures very close to nature and consider all animals and plants as thier god. Keep up rights and resposibilities of hindus in harmonious living with nature. Bro the commies and the congis looked upon us as descendants of kumbhkarn now that the drums and nagadaas have been sounded and the kumbhkarn is about to rise from his slumber the fear etall.Let the world know Hindu soya hai to kumbhkarn jag gaya to teeno lok me bhuchaal macha dega.10 min me Babri ko dhool me mitane ki taakat sirf Hinduo me hai aur wo kar ke bhi dikha diya.Kya ookhad liya commies aur congis ne hinduo ka. Mera yehi kahana hai hinduo ko shanti se jeene do warna mahakaal ka roop dhaaran karlega to phir teeno lok me bhoochal aa jae ga.
Beware Khangress are good at stocking religious riots & have many sleeperer cells. BJP has to be alert on this. 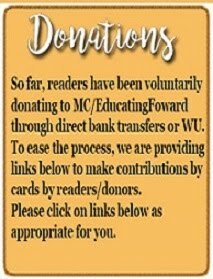 A good and timely article. Let the fear of Ram continue in the minds of commies. This is the last calling for Hindu revival. The commies & liberals are doing a 2 pronged attack to wipe out Hindus & Hinduism- settling Muslims in Hindu areas, facilitating ID papers for illegal immigrant Muslims & fighting for their naturalization, & attacking Hindu rituals, festivals & customs. If Hindus don't united & fight, they should be prepared to perish. The change is welcome. But hindus should shoot to kill. If these congis or lefties survive this time they will destroy hindus with double efforts. We have to boycott Airtel and go for some other else.They will loose two customers shortly.I will start with BSNL. Anything that exceeds its limits changes its course, universal law. Have heard from my great granny during Mughal period, they were not allowed ti worship and were punished n also slaughtered, so few families hid their kuldevta forming a tomb like wide flat mud bed, with god statu inside, call " chauri" and did regular hindu rituals. And continued to proceed and pass on these practices and learning to next generation. Pls circulate the pic of the calf slaughter on the streets of Kerala, widely during the run up to Gujarat elections. The congies must be taught a lesson for life. People may have different perceptions on the manner of celebrating different festivals. These cannot be the subject matter of court rulings. But if such court injunctions cross tolerable limits then the affected people have the right to protest. In Supreme Court there are many Khangress die hards are present & owe their allgeiance to Khangreess. Beautiful well articulated & well written article. Made me cry. 6) Any thing non-vegetarian shall attract more taxes. backedness as the only meaure. I agree with you. As a high-caste brahmin of sandilya gotra, nothing warms my heart more than seeing a poor low caste person struggling for an aadhar card so he/she can feed his kids a bowl of rice. I don't understand wy the paid media scum has to focus on negative stories like GST, demonetisation, economic slowdown, BJP's private citizen, etc when we are well on the path of becoming a Hindu Superpower! I tell you, brother, we'll be a superpower by 2020!. Just wait till 23:59:59, 31st December 2019. Has anybody asked your caste or religion ? So shove your stupidity into your arse. As far as the "poor low caste person struggling for an aadhar card so he/she can feed his kids a bowl of rice"---- You would have danced with happiness if middlemen keep looting the Govt subsidy like during Congress Govt. And your 80 year grandmother was not inhaling polluted air before Diwali ??? Agreed that naive Hindus have no uniform customs, but they all worship same Gods and think alike irrespective of castes. Now the time has come for all Hindus to unite to defend not just the community but the Nation. Start with basics like going to a Hindu shop for purchase, look for a Hindu run school for the children, watch a movie which is not made by Dawoods and Khans, rent your house to a Hindu etc. We have been bulldozed by too large of a heart for decades to a level of self deceit. Keep telling children how Afghanistan, Pakistan and Bangla were glorious Hindu nations once and were forced to abandon the sacred religion to adopt a violent cult. Mainly kick out congies/commies and liberals at all levels including elections. Start with small things and from NOW. My 80 year old anti-Hindu grandmother complained about how the pollution from the crackers was making it difficult for her to breathe. Thankfully, after making her read your article, she's at peace and is braving through the cancerous smog in Delhi. Thank you Ravinar. You're a true Aryan intellectual warrior. Btw, when are you going to expose the paid media that is slandering a private citizen whose only crime is being the son of Amit bhai? Sir, your comments are sarcastic and tunes like a liberal! Is your Grandmother (My respects to her as a cultured Hindu) against those who slaughter thousands of hapless animals to please a God or those who convert people's religion alluring them with a bag of rice and a pack of milk powder? So every trick to divide Hindus fall flat and now use Aryan/Dravidian terminology as last resort? This rant by a known BJP hater/AAP supporter gives an indication as to the distress the pseudo-secularists are by the actions of Yogi Adityanath. It's on the same Wire.in website. I had commented on it but the upholders of free speech have censored it.